For a successful wedding you need to have beautiful wedding decorations. Whether it's the table centerpiece or bouquets, you need to decorate the wedding area to enhance the beauty of the occasion. The wedding budget, season of the year, wedding theme, etc. are some of the important factors that should be considered while planning the wedding floral arrangements. There are different types of beautiful flowers that can be used for making bouquets, corsages, boutonnieres, centerpieces, etc. Flowers like the Casablanca lily, rose, etc. are some of the expensive wedding flowers while sunflowers and chrysanthemums are cheap wedding flowers. Thus you can choose the wedding flowers according to your wedding budget. Sunflowers are beautiful and bright flowers that can be used for inexpensive weddings. Scroll down and know more about making wedding bouquets using sunflowers. The sunflower is a simple and elegant flower known for its large flower head and bright yellow color. Every flower has a meaning and sunflowers are associated with longevity and loyalty. Thus using sunflowers for making wedding bouquets is quite meaningful. They make some of the best flowers for inexpensive weddings and are popularly used for summer weddings. You can purchase sunflowers at a florist or even grow your own sunflowers in your garden. Growing sunflowers is quite simple and sunflower seeds are available at economic prices. These flowers are available in various sizes and because of their large flower heads, you require very few flowers to make the wedding bouquets. The bright yellow color of these flowers blend well with other flowers that are white or purple in color. You do not require special decorative material to prepare a wedding bouquet using sunflowers. Even a bunch of 3 to 4 sunflowers held together makes a simple yet elegant wedding bouquet. Sunflowers are quite large in size and thus you can make wedding bouquets with a lesser number of sunflowers. 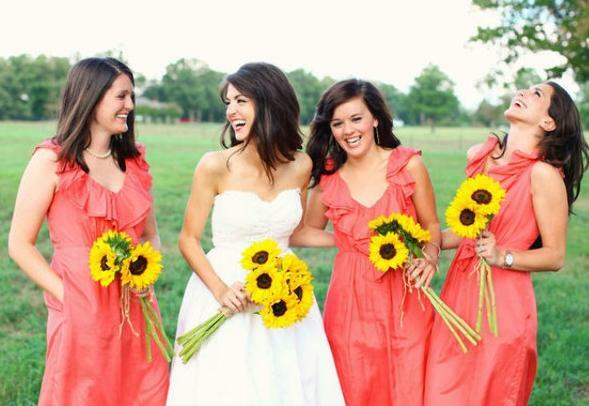 There are lots of advantages of using sunflowers for wedding bouquets. Sunflowers have thick and large stems, and hence you do not have to make special arrangements for holding the bouquets. These flowers last quite long and hence the wedding bouquet look fresh for a longer period of time. The wedding flower colors should always complement the gown of the bride and yellow being a nice bright color blends well with almost any color. While using other flowers in the bouquet, make sure that you use flowers with colors that will mix well with the yellow color. Mums and carnations with their white, purple and orange colors, make a nice addition to sunflower bouquets. While using sunflowers with large heads make use of just 3 or 5 flowers and use more than 10 flowers when you are using small sunflowers with a diameter of 2 inches. Also use decorative material like baby's breath and floral wires. While arranging the sunflowers, make sure that every flower faces outward in different directions. If you simply squeeze the flowers together, the petals will get crushed. While arranging the sunflowers in the bouquet, arch the stems slightly to give it a natural look. Though sunflowers are not popular as roses or calla lilies, these flowers are the best choice when you have a low budget for the wedding decoration. Sunflower wedding bouquets can be used for summer weddings, beach weddings or a sunflower wedding theme, so have a beautiful and bright wedding and cast away any hint of gloom with sunflowers.